Apple says it will fight the U.S. government about sharing information from the iPhone used by a shooter in a deadly attack in California. The Federal Bureau of Investigation, or FBI, wants Apple to help agents get information from a phone that is locked. Apple head Tim Cook says the company will not assist the FBI. He says to do so could damage encryption for millions of other users. Cook's statement was posted early Wednesday on the company's website. It could start a legal dispute between the federal government and the U.S. information technology industry. A U.S. judge ordered Apple to help the FBI break into an iPhone belonging to Syed Farook. Farook was one of the shooters in the December 2 attack that killed 14 people. Farook and his wife, Tashfeen Malik, died in a gun battle with police. The judge's ruling requires Apple to help the FBI break into Farook's work iPhone. The iPhone has a self-destruct feature. 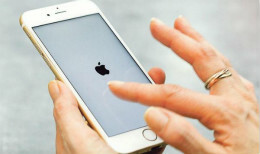 The feature destroys iPhone data after several unsuccessful attempts at a password. The FBI wants to be able to try unlimited combinations of passwords until it finds the right one. President Barack Obama has called for stronger encryption to keep the Internet safe for users. Cook described the ruling as an example of government overreach. He called for public discussion. He said Apple wants "people around the country to understand what is at stake." He argued that the order could lead to a key "capable of opening hundreds of millions of (iPhone) locks." Federal prosecutors told the judge that they cannot access Farook's work phone because they don't know his password. Under U.S. law, a work phone is generally the property of a person's employer. The judge told Apple on Tuesday to estimate how much it would cost to break into the phone. Apple has provided encryption on its iPhones since 2014. Only the user can access the data through a password. The judge's order requires that the software Apple provides be programmed to work only on Farook's phone. The order gives Apple five days to notify the court if it believes the ruling is unreasonable. Kevin Bankston is director of the digital rights group Open Technology Institute at New America. He said the ruling could make people suspicious that the government might secretly place malware on their devices or software. Investigators think Farook's phone may tell who communicated with Farook and his wife, and where they traveled. The police are interested in an 18-minute period after the attack when they did not know the location of the suspects. Farook was not carrying his work iPhone during the attack. It was discovered in a search. The phone was programmed to destroy data after 10 straight unsuccessful unlocking attempts. It is currently illegal to export this encryption technology from the US. They're going to be famous, but unless something happens, they're going to self-destruct. If a user wishes to remove malware upon discovery, they need only find it in the list of apps, and uninstall it. 1.The judge told Apple on Tuesday to estimate how much it would cost to break into the phone. There was no one nearby who might see him trying to break into the house. She finally broke into films after an acclaimed stage career. 2.He said Apple wants "people around the country to understand what is at stake." At stake are more than 20,000 jobs in Britain's aerospace sector. At stake is the success or failure of world trade talks.